An iconic whisky festival is celebrating its 20th birthday in style this year. Organisers of the Spirit of Speyside Whisky Festival officially announced the line-up for its celebrations yesterday. It has been revealed that this year’s festival is on course to host nearly 600 events – almost 100 more than previous years. Visitors will get the chance to explore distilleries in behind-the-scenes tours, and take part in a host of community events inspired by Scotland’s national drink. The festival will run from May 1 to 6. The festival’s chairman James Campbell said: “It’s hard to believe that the festival has been around for 20 years, but when the team launched the festival they knew they had created something very special that had the potential to attract a global audience. “The festival is fantastic for those who are deeply passionate about whisky because of the unique opportunities that it presents to tour lesser-known distilleries and have a dram with the managers and master distillers that are so important to the industry, but what makes it different to any other festival is the way that it brings people together. 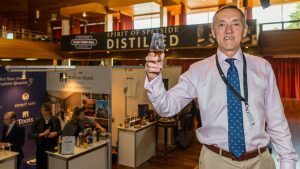 Tickets for the Spirit of Speyside Whisky Festival will go on sale on Tuesday at noon, with whisky fans from around the globe poised to snap up places. Mr Campbell added: “We are absolutely thrilled to be celebrating our 20th anniversary this year so it is incredibly fitting that the 2019 festival will be the biggest on record in terms of the number of events being hosted. The event programme is available to view at on the Spirit of Speyside website ahead of the tickets going on sale next week.